Brand Channel is always branding and always on. They recently posted this article on their site check it out. Coca-Cola has been getting very serious about its “Open Happiness” campaign. Now it may even be ready to try to beat swords into plowshares—or at least into vending machines. Relations between India and Pakistan are marked by many things–and happiness is generally not one of them. But Coca-Cola recently brought both nations together–or at least brought citizens of both countries face to face–over vending machines. Ad Age reports that a big announcement “is coming soon” about a “major project” for the brand, possibly involving vending machines that will virtually connect consumers in India and Pakistan, two countries that long have had sectarian, sometimes bloody, differences. As depicted in a teaser video that Coke released in December, the machines would use video technology so that users in the two countries could see each other and “touch hands virtually,” the magazine reported. And why not? Coke already has shown that its “happiness project” and global marketing theme “Open Happiness” have accomplished more actual good in the world than most marketers’ cause-tinged efforts. Not since the brand hatched “I’d Like To Buy the World a Coke” 32 years ago (and then followed up with the anthem “I’d Like To Teach the World To Sing” in a TV ad with the agency-assembled Hillside Singers) has the brand created such a direct impact on global spirits with its sunny disposition. ICE VENDING MACHINE – WHAT A COOL IDEA! get ice has evolved into a huge industry. The packaged ice industry accounts for $4 billion in sales. consumers want ice in their drinks. of the ice vending market. that provides consumers fresh, delicious bulk ice. at a price that keeps consumers returning for more. Let Carts Blanche’s, VendaPromotions help build your brand promotional customer loyalty. New customers might learn to love your product or service and become long-term clients. Or they might abandon you as soon as the promotion is over and continue to hunt for bargains. Converting bargain hunters to permanent customers depends on developing brand loyalty. For example, if your excellent customer service or high-quality products impress them, they are more likely to stay with you after prices return to normal levels. The Conversation Manager says, “So, the thing is to turn this sales promotion into a customer relationship. By exceeding expectations, by connecting and by giving redeemers reasons to actually plan a repeat visit. I once was lucky enough to book a discounted Bed & Breakfast in Firenze, Italy. It was just great. The owner Edoardo and his wife showed us around town, helped us when we needed and made us feel very very welcome. When we evantually left, Edoardo asked me if I liked the Bed & Breakfast. I replied I did. 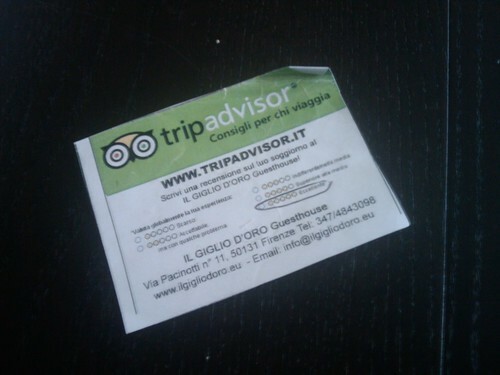 Edoardo gave me a small piece of paper asked me “Can you do me a favor, if you like it this much, can you go to tripadvisor.com and write a nice review? That would really really help me.” Edoardo turned a discount into a pleasurable experience and even turned me in an ambassador for his product. THAT is a smart sales promotion. Imagine distributing your company promotion through coupons via VendaPromotion and having the customer comment instantly on your Facebook page….. Turn VendaPromtions into your own personal Groupon and instant social media blast. Living in Mobile, Al. should be training enough to equip you with lots of umbrellas to have stashed everywhere. Especially since Mobile is one of the cities with the most annual rainfall recorded. I can see this in restaurants, parking lots, city events, hospitals……. just about any public place it would be needed. For a small business this vending machine would be a win, win addition. The machine, called the Chef’s Farm, was developed by Dentsu and can produce 60 heads of lettuce per day (or 20,000 heads per year) grown under 40 watt fluorescent lighting housed in a chrome housing that can be stored conveniently in any restaurant. The portable fluorescent garden grower is on sale for $90,000, with the target market ostensibly being restaurants that want locally manufactured, sun-free vegetables on site. For the United States, the Western Hemisphere has provided a fertile ground for export opportunity. It is the destination for approximately 42 percent of U.S. exports, more than any other region across the globe. Since 2009, U.S. goods exports to the Western Hemisphere increased by more than $200 billion to nearly $650 billion, supporting almost four million U.S. jobs in 2011. Specifically, exports to Canada, Mexico, Brazil, Panama, and Colombia are at an all-time high. The United States’ relationship with these Western Hemisphere partners is a top priority for global development. That’s why the America’s Competitiveness Forum (ACF) is such a key event for the region. Since 2007, the ACF has provided Western Hemisphere nations a chance to come together to share priorities, successes, and lessons learned to support sustainable growth in the region. It has attracted thousands of participants from the region’s public and private sectors, including heads of state and economic ministers, as well as leaders from business, academia, and civil society. This year’s forum will take place in Panama City, Panama from Oct. 2-4. It will be an important step toward furthering the relationships that exist within the hemisphere. It will also provide U.S. companies access to high-level officials and potential clients to explore new export opportunities. For more information about the ACF or to register for the Forum, visit: http://www.competitivenessforum.org/. We will following this upcoming forum for future resources in the vending industry opportunities. What’s First in Exporting VendaCarts Food Truck? Comments Off on What’s First in Exporting VendaCarts Food Truck? product or service to market. billion from the same period of 2012 to reach $5554.7 billion. This was the highest quarterly total on records, as reported by Department of Commerce. Yes, I would think it is worth it! Our VendaCarts Mobile Retail Stores are sold empty, without any vending machines. vending machine manufacturer that distributes in their country. Does your small business have an export plan? Go to the experts in your area first to begin the process of understanding exporting. Export Alabama Alliance can help small businesses meet the challenges of doing business overseas.